With the stretch run approaching, let’s take a look at how teams have been performing statistically with the playoffs standings being so close at this point. The teams are ranked in order of offensive rating with the blue bars representing their offensive rating and the red bars representing their defensive rating as each number refers to points scored or given up per 100 possessions. The difference between the two is their net rating as all eight teams currently in playoff places have had a positive net rating this season. It is no surprise that Seattle is on top of the standings right now as they boast the league’s most efficient offense as well as an excellent defense. Atlanta has the next best record with a very different formula, having the eighth best net rating right now, but being the most efficient defense in the league. At the other end of the standings, the teams that look set to miss the playoffs have one thing in common, occupying the bottom three spots when it comes to defensive efficiency. 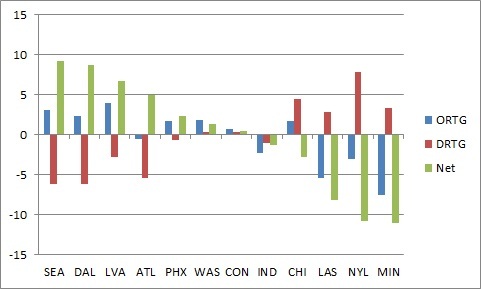 Teams are ranked in order of change in net rating. The blue bar represents the change in offensive rating and a positive number is good. The red bar represents the change in defensive rating and a negative number is good. The green bar combines the two for the change in net rating and a positive number is good. Seattle’s improvement is clear this season as their net rating has improved the most of any team, combining improvement on both ends of the floor. 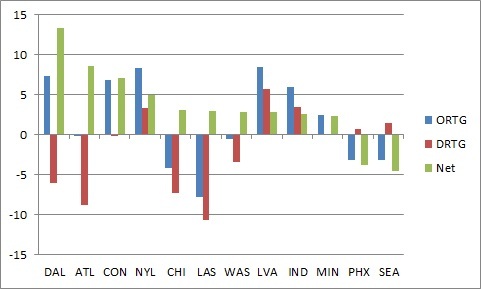 Dallas has also improved in both categories while Phoenix has had smaller increases compared to last season. The spotlight in Atlanta may be on the players added with offensive pedigree, but their big improvement so far has been on defense. While Las Vegas is still chasing a playoff place, the improvement from their last year in San Antonio is clear as their offensive efficiency has improved more than any other team in the league. One factor that could be contributing is taking better care of the basketball as they turned it over on 21% of their possessions in 2017, the worst mark in the league by nearly two full percentage points, but have only turned it over on 16.1% of their possessions this season, within a tenth of a percentage point of the best in the league. Interestingly, Chicago’s offense remains efficient despite taking over the lead in turnover percentage after being second last season. The league has been marked by the dominance of Minnesota and Los Angeles in recent seasons and their fall back into the middle of the pack in the standings is mirrored by a drop in efficiency on both ends of the court. The Lynx had the top offense and defense last season, but have fallen to eighth on offense while still being third on defense. The Sparks were second in both categories, but now have the sixth most efficient offense and the fourth most efficient defense. While both teams had the biggest drop on offense, the biggest drop on defense belongs to New York. Their vaunted defense was the third best a year ago, but has become the second worst to follow their move down the standings exactly. A possible culprit for their drop has been a decrease in rebounding prowess at both ends of the court as they had the highest offensive and defensive rebounding percentage last season, but have seen both drop more than five percentage points this season to put them in the bottom half of both categories. The expectation in basketball is that the home team will have an advantage, but how has that played out in the 2018 season so far? Home teams are 81-72 so far this season, but have some teams performed better than others at home? 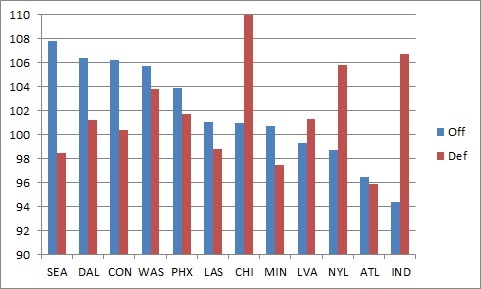 Teams are placed in order of how much their net rating is higher at home than on the road. The blue bar represents offensive rating and a positive number means that the team is more efficient at home than on the road. The red bar represents the defensive rating and a negative number means that the team has a more efficient defense at home than on the road. The green bar combines the two and a positive number means that the team performs better overall at home. The values represent points per 100 possessions either scored or given up. Interestingly, exactly half the teams have a higher offensive efficiency at home and exactly half of the teams have a better defensive efficiency at home. When you combine them and take into account magnitude, ten teams play better overall at home than on the road. The two teams that do not are worse in both categories at home. In the case of Seattle, their record no matter where they play has been excellent so having the worst disparity is clearly not affecting them. Phoenix is a different story as they are the only playoff contender with a losing home record. Their road record is excellent and right behind the Storm, but with six home games and only two road games remaining, they may want to figure out how to improve their play at home. Three teams play better at both ends of the court at home, but none have as big of a difference as the Wings, who have the worst road record among playoff contenders. Interestingly, the two teams that have the biggest offensive improvements at home are the ones playing in new venues as the Aces and Liberty are each more than 8 points per 100 possessions better at home than on the road. Indiana also has a stronger offense at home and those are three teams who play significantly worse defense at home than on the road. The Sparks may have the worst disparity in offensive efficiency at home compared to the road, but their defense has the best margin of difference between venues, making them more efficient at home overall. Similarly, Chicago’s offensive is less potent at home, but their league worst defense is less bad as well.